BRYAN EATON/Staff photo. With a packed house at the Heritage Towers' club room in Amesbury, Rick Roth of Creature Teachers describes the life of a kinkajou which is on his shoulder. 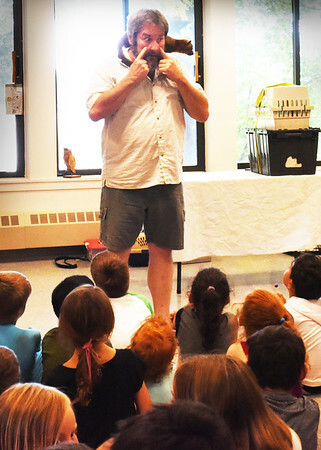 His presentation of different animals, part of the Amesbury Public Library's Kids' Summer Reading program, was sponsored by Friends of the Library and the Amesbury Housing Authority.